Zatkoff Seals & Packings is proud to service the US Government by holding the ITAR Registration which is valid through 3/31/2019 at which point it will be renewed. All manufacturers, exporters, and brokers of defense articles, related technical data and defense services as defined on the United States Munitions list (part 121 of the ITAR) are required to register with the Directorate of Defense trade Controls (DDTC). Registration is a means to provide the US. Government with necessary information on who is involved in certain manufacturing, exporting and brokering activities. Registration does not confer any export rights or privileges, but is a precondition for the issuance of any license or other approval for export. Once an entity has properly registered with the DDTC, and be approved, a unique registration code will be assigned to the registrant. The code consists of a letter prefix followed by a 4 or 5 digit code. The code is proprietary to the registrant and should be handled as such. Company registration codes should not be posted on line or given out freely. The period of validity for new and renewal registration is twelve months for the date of issuance. The expiration date is included in the registration letter issued by the DDTC and can be provided upon request. 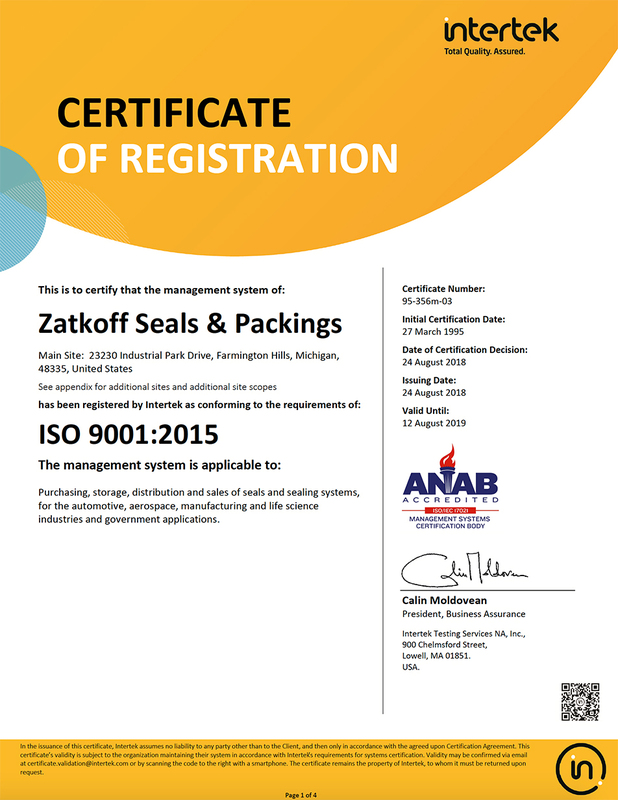 Zatkoff Seals & Packings is registered with Joint Certification Program (JCP) with an expiration date of August 15, 2018, which at that time will be renewed. The Joint Certification Program (JCP) certifies Canadian and United States (U.S.) contractors for access to unclassified military technical data belonging to Canada's Department of National Defence (DND) and to the U.S. Department of Defense (DOD). This Program helps to protect controlled Unclassified Militarily Critical Technical Data (MCTD) and technology from common adversaries, but allows it to flow to certified Canadian and U.S. companies that have a legitimate need-to-know for business purposes. This program is effective in protecting the competitive edge of North American companies by ensuring that only eligible companies are provided with this data.